“Kindred Spirits.” Stainless steel outdoor sculpture, Midleton, County Cork, Ireland. I am aware that I am sitting in a house on Wappo land, in the Mayacamas Mountains. I am sitting on land that is owned collectively, in a house that is owned collectively, as part of one small effort to live an alternative to the steamrolling system called private property and industrial capitalism inside of which we all live and work and laugh and struggle. And still this land, this house, the life I live, is saturated with privilege. I am aware that people with privilege often turn to oppressed communities and cultures to project and pick and choose those things that they imagine can assuage their guilt, their discomfort, their misgivings about the system in which they live. Thanksgiving is usually that. I don’t want to do that. And yet I am thankful that at least I know this is Wappo land, that should not have been taken, though I will probably never know what it means to be displaced, dispossessed, despised in the way that human community was. I am thankful that I know that the tan oaks around us (struggling with pathogens, yet still there, impossibly towering in some places on this land, and beautiful) provided so much sustenance, and the Wappo traveled at least once a year to the sea. 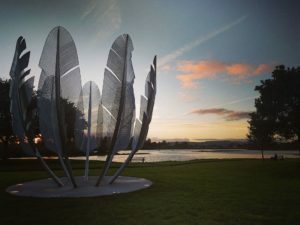 I am also thankful that I could look at up at my mother this morning when she gasped at the beauty of this sculpture in County Cork, Ireland, and I could tell her that it commemorates an act of indigenous generosity that took place in 1847, when the Choctaw people who had been displaced and dispossessed sent money to Irish famine migrants, displaced, dispossessed, and despised – and I could see her tears and witness the beauty of recognition, as it happened, that very moment. The recognition that we never know, we never know, when we may become refugees, and be the ones who need sustenance, need connection, need a hand extended across the sea. I am thankful for all these things I know, and that my mind is still supple enough to keep listening, keep learning, and that my voice is still strong enough to keep speaking, and that I am surrounded by so much love and vision, on this land, in this house, in this country which I know we will not give up easily to darkness. May you all be blessed with connection, today or as soon as you need it. If you do, call me.